The designs in this article are wonderful examples of professionally designed London Underground themed seating plans, where tables are named after each line on the tube map and guests each have a station! I really wish we’d had one of these at our own wedding! There are lots more great examples on our Pinterest board. If you don’t have the budget to have one professionally made, or if you simply fancy having a go at making your own Underground themed plan, there are a number of ways that you could consider. London Underground Map with Guest Names on Luggage Labels. Buy a kit: Use a standard London tube map and add your guests’ names. This idea uses luggage labels that have been pinned to the map to show which guests are seated at which table. You can buy a kit including the map and 12 luggage labels for around £15 from notonthehighstreet.com. Use photo editing software to digitally edit a London Underground map, replacing station names with guest’s names. Luckily, as the background for the map is white, this should not need a great deal of technical expertise! Dust off your painting set and practice your calligraphy – trace the London underground map onto plain paper and use your paints and pens to craft your own version. This lovely example is by the same professional designer as above. Use coloured string and panel pins in a plain white wooden board to make a funky string Tube map design. You could then tie on guest’s names, or print them onto the white board behind your string map. Underground bow ties for the men and skirts for the women. Set each table a ‘find the animal‘ quiz – there are animals hidden in the London underground map, who can find them? The Transport for London shop has a wide range of London Underground related paraphernalia, ranging from mugs and bags to toys and t shirts. Get some Underground maps laminated, and use them as coasters. Make bunting from London Underground maps to decorate your reception venue. Use your own home town or city, even if it hasn’t got an underground system. Use key landmarks to map out different ‘lines’ in the style of the London Underground map. For example, here is one of Brighton and Cardiff. Use your favourite hobbies, such as films or books, to create your own underground map. 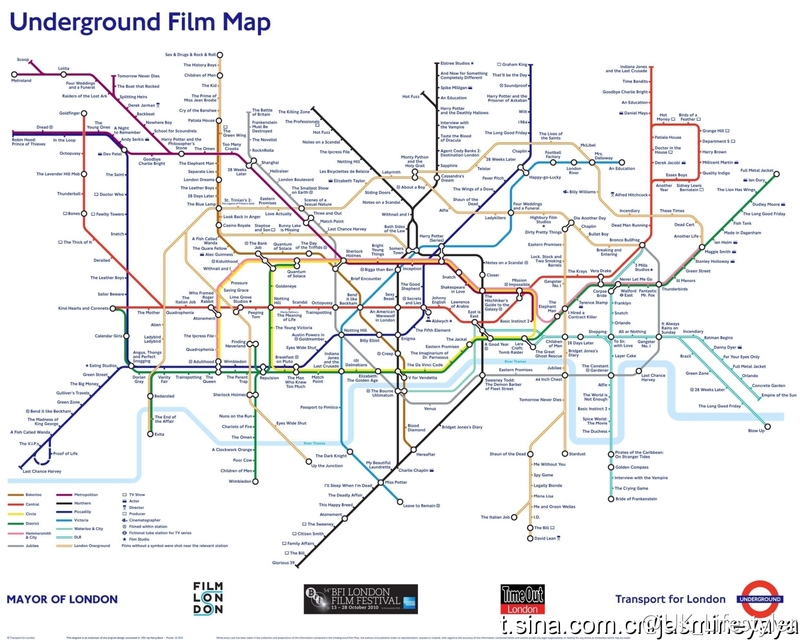 Here is a map constructed by London Underground and the London Film festival, and here is a one showing popular music history with each line a different musical genre. Use each line of your map, representing a film or musical genre, as table names. Each guest then has a film or musician as their place holder at the table. For medical types – ‘Underskin‘ map, the human body as an underground map! Tables could be named after the different ‘lines’ in the diagram (Arterial, digestive, lymphatic etc) with specific body parts for each guest – bride and groom get the heart, but who will get the little toe?! Remember to check our Pinterest board for a whole host of inspiring ideas for your own Underground map seating plan. Whether you use a London Underground map or design your own, your guests are sure to be thrilled with this totally unique and unusual take on a wedding seating plan.